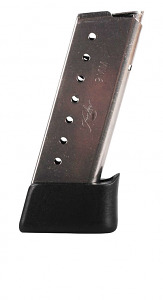 Stainless Steel Kimber Solo extended magazine. Holds 8 rounds of 9mm ammunition with extended baseplate. Made by Kimber.